In the spring, an updated “Celebration of New Beginnings” is performed and enthusiastically received by full audiences at New Presbyterian Church in Wilton Manors, Life Gate International Christian Center in Hollywood and Plantation Community Church. The presence and glory of God is reflected in the number of salvations and renewed commitments to the Lord. In December, we will perform an expanded version of “The Gospel According to Scrooge” at New Covenant Church in Pompano Beach, Community of Hope in West Palm Beach and St. Paul’s Lutheran Church in Boca Raton. This heart-warming musical production portrays the story of redemption through the life of a cynical, miserly old man, Ebenezer Scrooge, and is a family friendly show that will be a delight to all ages. An epic story of love and redemption, “The Scarlet Thread, a musical” is performed at the Hollywood Central Performing Arts Center in April, 2017 playing before 2,000 people over the course of four nights. 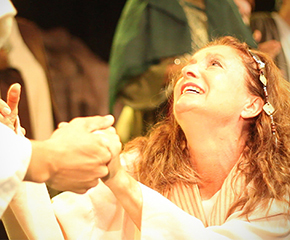 With a cast and crew of 68, combined with high production values, each performance received standing ovations with a record number of salvations and rededications reflecting the blessing of God upon this production. “The Scarlet Thread” portrays the love of God through Jesus Christ starting in Genesis and weaving throughout the Bible to his resurrection. As fall approaches, Revelation Ministries sustained a stunning blow with the unexpected passing away of our Founder and President, Travis Johnson. Revelation Ministries grew out of Travis responding to God’s call to minister the Gospel of Jesus Christ through drama, dance and song. As a result, since 1995, Revelation Ministries has shared the gospel locally throughout southeast Florida as well as in the Ukraine, Russian, England and Israel. In honor of Travis Johnson, we will continue the ministry of bringing the love of Jesus to others through the impactful medium of the performing arts. 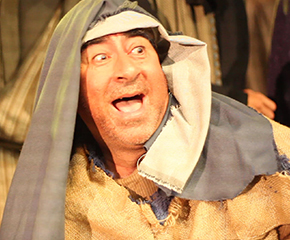 In December, “The Gospel According to Scrooge” was performed to packed audiences at Pompano Beach First Church of the Nazarene and Trinity Lutheran Church in Delray Beach. Response cards indicated many lives were touched and changed through the redemptive story of God’s love in this poignant and joyful musical production. On December 25, 2015, six Revelation Ministries team members left their Christmas celebrations behind to travel to St. Petersburg for a 12-day trip to assist the first-ever production of “He Lives” in Russia. The team helped teach, train and costume the new team of 32 Russian actors. In January, 2016, the new Revelation Ministries Russian team toured to three venues with “He Lives!” and performed to standing-room-only audiences. The people showed a hunger for Christ by remaining long after the last song to ask questions and give personal testimonies. In 2016, work began on the script and music for a brand-new original production, “The Scarlet Thread,” an epic story of love and redemption, to be performed spring 2017. Due to the complexity and sheer length of the production, an extended rehearsal time of 8 months was required to gather the cast and crew, and much work went into the music, choreography, stage construction, props, costumes and marketing. In the spring, Revelation Ministries toured with “He Lives!” performing at Cristo La Roca, Trinity Lutheran Church of Delray Beach and Hollywood Ukraine Baptist to full houses with many receiving Christ. The Broward County Transitional Center welcomed Revelation Ministries once again and many men and women stood up after the performance to receive Jesus into their hearts. At Christmastime, an expanded cast with even more children, new scenes and music was added to the new script, “Everlasting Joy,” an adaptation of Charles Dickens’ Christmas Classic, “The Christmas Carol.” The two-part show was performed along with “He Lives!©” at 7 performances at Trinity Lutheran Church in Lighthouse Point. Revelation Ministries joined with Victory Church to present an Easter Sunday celebration at Florida Atlantic University. Fifteen hundred people attended at the Carol and Berry Kaye Performing Arts Auditorium and hundreds came to the Lord. Revelation Ministries premiered the original script “Celebration of New Beginnings” and returned for engagements at Covenant Village, Providence, and First Church of Coral Springs, and for the first time at Sheridan Hills Baptist Church. “The Inspirations of Christmas” was written as an introduction to “He Lives!©” and the new Christmas show was performed at the First Presbyterian of Pompano Beach, Living Water, Parkridge Baptist, Omega and Calvary Chapel North Lauderdale. The return performance of “He Lives!” at the Pompano Federal Detention Center brought 200 attendees and 65 people saved. Spring performances were hosted by various churches, such as First Church of Coral Springs, Victory Church, Redemptive Life Fellowship, Parkridge Baptist, Calvary Chapel North, and First Baptist of Fort Lauderdale, home of the renowned Christmas Pageant. Share Jesus International extended an invitation to perform “He Lives!© at the Pentecost Festival in various venues throughout London, England. Audiences were awed and many came forth to share life-changing testimonies. The Refuge’s sponsors, Calvary Chapel Fort Lauderdale, invited Revelation Ministries to present the gospel to their homeless shelter in Fort Lauderdale and many came to Christ. Covenant Village, a retirement community in Plantation, Florida, asked Revelation Ministries for a return show. The Worship Center collaborated with Revelation Ministries for their annual fundraiser. Other hosting venues were Engrafted Word and Plantation Community Church. 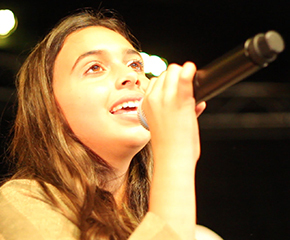 For the spring, requests for shows were accepted and performed in many churches in Broward and Palm Beach counties. At the Pompano Detention Center, a captive crowd of 300 watched the presentation “He Lives!”© and 80 people stepped forward to receive salvation. Performances were hosted at The Refuge homeless shelter, the women’s jail, as well as churches such as Riviera Beach, Plantation Community and Living Water. Revelation Ministries travelled to Israel in 2011 to perform “He Lives!©” at various venues. Beth Hillel Temple hosted a fundraiser to support the mission trip. Revelation Ministries partnered with Discovery Ministries to perform in Nazareth, Bethlehem Baptist Church (which is under Palestinian rule), the Jerusalem Mission House as well as open air on the busy Ben Yehuda Street. Many come to Christ. “Devil or Angel©,” an original script, is presented for two nights at the Fort Lauderdale Library to packed audiences. Revelation Ministries continued to perfect and promote performances of “He Lives!©” locally throughout Broward and Palm Beach counties in many churches of various denominations, homeless and detentions centers, jails and juvenile detention centers. Share Jesus International invited Revelation Ministries to perform for their Pentecost ’08 in various churches throughout London, England. It was an historic event when the team performed the uniquely designed “He Lives!©” on the Green at Westminster Abbey. “He Lives!©” premiered at the Belle Glade Correctional Institute at the request of Chuck Colson, founder of Prison Fellowship. The piece was designed to meet the specific standards required by prisons, and actors uniquely posing as props was used for the first time. “Creation Celebration” is written and performed with ballet and song. This Easter production was held before several thousand people and public professions of faith were made. 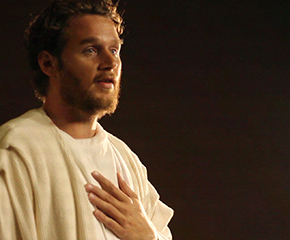 A partnership with Samaritan’s Purse was vital in bringing the production to fruition. The Ukrainian Creative Team presented before 15,000 in the God Embassy’s 12th Anniversary Celebration, a four-day event attended by government officials from ten nations and many renowned international religious leaders. “Christmas Celebration,” an original pageant written for the Ukraine, was produced in 2004 and 2005, with a cast and crew of over 125 nationals from 15 different churches and a 33-piece orchestra. Five shows were experienced by over 5,000 people. Many came to accept Christ as their Savior. The Ukrainian Creative Team recruited and trained a 125-member choir. More than six thousand people saw the gospel portrayed through music and drama during the Orange Revolution, an historical political event backed by Ukrainian believers. From 2001 to 2004, Revelation Ministries trained teams of young people from Florida and the Ukraine to share their faith on the streets of Kiev, Poltava and Donetsk. Through creative sketches and music, these teams shared the gospel in churches, orphanages and detention centers. Hundreds came to accept Jesus as their Savior. Travis Johnson traveled to Kiev, Ukraine with a missionary group. He saw a deep spiritual need in the people to know God, especially in the younger adult generation. “It’s Never Gonna Rain,” Revelation Ministries’ first production with original script and music featuring Noah and the story of the ark, was written specifically for a Black-Tie fundraising event. Revelations Ministries came into being as a registered corporation with the State of Florida and as a 501(c)3 nonprofit organization with the Federal government. Travis Johnson received God’s call to take the Christmas pageant to Russia.